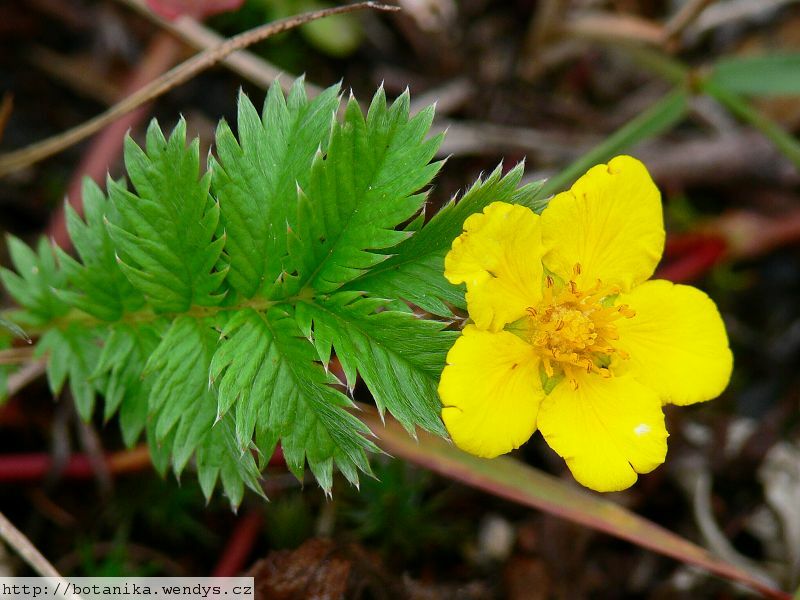 Contemporary medical herbalists believe that silverweed's main medicinal value lies in its astringency. It is less astringent than the related P. erecta, but it has a gentler action within the gastro-intestinal tract. 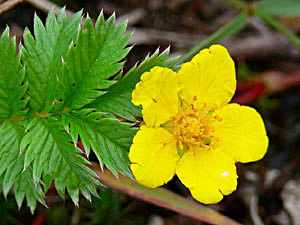 The whole plant is antispasmodic, mildly astringent, diuretic, foot care, haemostatic, odontalgic and tonic. A strong infusion is used to check the bleeding of piles and to treat diarrhoea, it is also used as a gargle for sore throats. Externally, it is used as a powder to treat ulcers and haemorrhoids whilst the whole bruised plant, placed over a painful area, will act as a local analgesic. The roots are the most astringent part of the plant, they are harvested in late summer or autumn and dried for later use. The leaves are harvested in early summer and dried for later use. Ditches and moist calcareous soils. A common weed of cultivation. Root - raw or cooked. It can also be dried and ground into a powder then used in soups etc or mixed with cereals. A nice taste, crisp and nutty with a somewhat starchy flavour. The roots are rather thin, though perhaps their size cold be improved in cultivation. Edible young shoots - raw. A tea is made from the leaves. A sprig placed in the shoe can help prevent blisters. An infusion of the leaves makes an excellent skin cleansing lotion, it is also used cosmetically as a soothing lotion for reddened skin and for the delicate skins of babies. All parts of the plant contain tannin, though the report does not give quantities. Seed - sow early spring or autumn in a cold frame. Prick out the seedlings into individual pots once they are large enough to handle and plant them out into their permanent positions in the summer. Division in spring. Division is also very easy at almost any time the plant is in growth. Larger divisions can be planted out direct into their permanent positions. We have found that it is better to pot up the smaller divisions and grow them on in light shade in a cold frame until they are well established before planting them out in late spring or early summer.